Over the past 10 years or so, I have experimented with growing simple topiary. Photo 1 shows one of a pair, that I started on old upright yews, that were planted about 57 years ago, on the side of my house. For years they were just clipped squares. I grew the ball on stem part. Because they were old yew bushes, when I started the topiary part, and are sited on the north side of my house, they took longer to grow than young plants in more sunny locations. Photo 2 shows a Juniper that I bought years ago. When I got it, it was only two spheres high. It has some winter kill, but is doing fine. Photos 3 and 4 show some new topiary I started just 3 years ago. Growing a Topiary from an Upright Yew … To grow your own topiary, you must use an Upright Yew, or some other evergreen that has an upright growth habit. 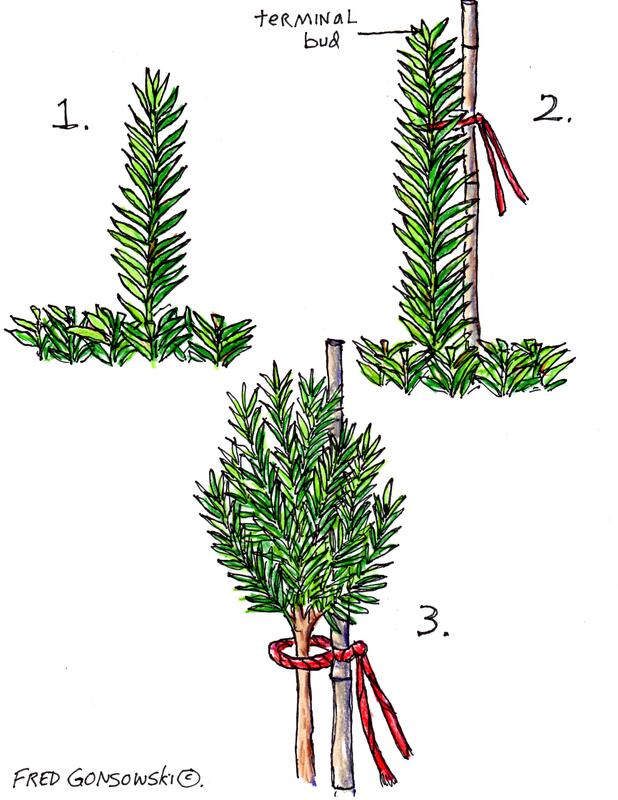 If you use a Spreading Yew, its growth habit is wider than tall. Step 1 ..In the Spring let new growth develop on the yew for a while before shearing. Try to find a new growth tip as close to the center of the bush as possible. With hand pruners, or good scissors, cut away all the other shoots around it. Use electric or gas propelled shears far away from the new growth tip, so you won’t nick it, or cut it off by accident. (see Illustration 1). Step 2 .. Stab a bamboo stake 12 to 18 inches taller than the new growth tip into the center of the yew, and into the ground, as close as possible to the new shoot. Now let it grow. As it grows, loosely tie it to the bamboo stake with a piece of jute, to protect it from being whipped by the wind and damaged. (see illustration 2). Step 3 ..After it is about 13 to 15 inches tall, cut/pinch off the terminal bud (top of growth tip) (see illustration 2). This will stop the upward growth action, and encourage side growth on that new stem. Once side growth starts, pinch off lower growth on the stem. (see illustration 3). 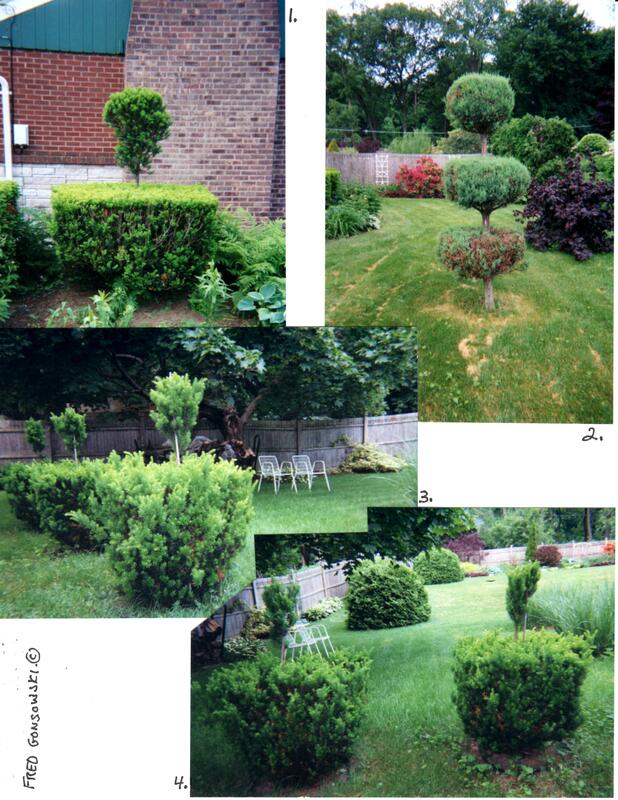 I wanted 10 inches of exposed stem on the topiary in (Photo 1), 7 inches of stem on the topiary in (photo 2) and 6 inches of exposed stem on the topiary in (photos 3 and 4). After that let the new top of your topiary grow. Trim as needed to get the desired shape you want. On occasion new growth will try to regrow on the stem. Pinch or cut it off. Your topiary will start looking like something at the end of the second year. Don’t rush to eliminate the bamboo stake. Make sure your new topiary support branch is thick and can support the top growth. After a few years growth, you can follow the steps again, and grow another ball, or whatever shape you want on top of what you already have. Your options are endless. You could even try growing multiple balls on the plant. This entry was posted in Bushes, Shrubs, Trees, Fred's Garden at Whimsey Hill House, The Spring Garden, The Winter Garden. Bookmark the permalink.